Surprisingly, this story is told in the 400 year old 'Vank Cathedral' in heart of Iran (Persia at the time) in the city of Isfahan. 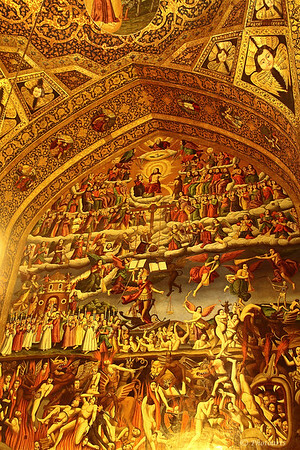 Lower levels of this mural depicts the fire of hell and demons swallowing the sinners while the upper levels shows the life of Christ and those saved. Some depict the torture of the Christians believers by the ottoman empire as the story of lower mural. Beautiful mural and a terrific shot! Wow! What an incredible work of art!